A burning smell belongs outside on a grill or campfire, not in your kitchen. If you detect a burning smell coming from your dishwasher during drying, you should investigate as soon as possible. The smell could be due to trapped plastic or a faulty heater or motor. Regardless of where it's coming from, it should be repaired. A burning smell in your dishwasher should be investigated. If you think you detect a burning smell coming from any appliance, the first thing you should do -- before even attempting to work on it -- is to turn off the electricity. Unless you have a portable unit, the wiring for a dishwasher is connected beneath the cabinet at the electrical panel. In order to cut off the electric supply for these type of appliances, you'll need to cut the circuit for the dishwasher at the main circuit breaker. 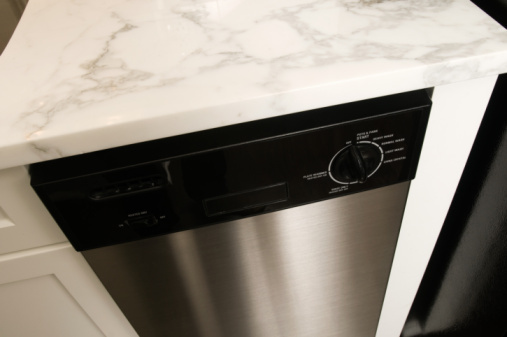 A portable dishwasher is typically plugged into the nearest outlet. Power for a portable dishwasher can be cut by pulling the plug out of the socket. 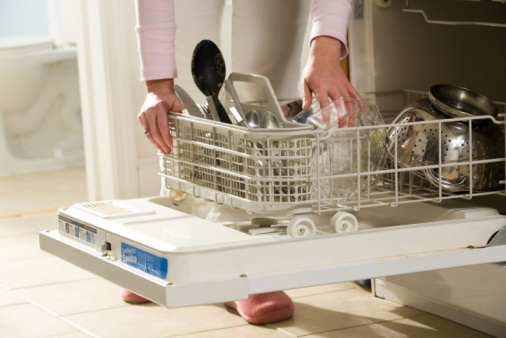 Dishwashers have three main connections to the utilities in your house: the water, sewer and electricity. When a dishwasher starts, it pulls in water from the water supply into the unit. It mixes the water with soap inside the machine and then sprays this around the cabinet by pumping the water through a spray arm. The dishes are then rinsed with a stream of fresh water. In between the two cycles, the dirty dishwater is pumped out by the dishwasher pump through the drain hose. An electric heating element then starts inside the dishwasher cabinet. This provides the heat that air dries the dishes. The heating element is usually located at the rear of the cabinet, just a few inches above the dishwasher floor. It looks similar to an electric heating element in an oven. The top of the heating element is waterproof and runs through the cabinet to where it connects to the electrical system of the washer below. A burning smell from a dishwasher during a drying cycle typically means that there is something amiss with the heating element. This could be something inside the dishwasher that's trapped up against the element, such as a plastic food container or plastic utensil. If that is not the source of the smell, it may be a sign that the heating element is failing. Another, less obvious reason for the smell, may be due to the fact that the motor is failing, and it is only being smelled during the heating cycle. Have the motor checked by a qualified technician.